This post is very different from any I have previously written. I have been privileged so far to be used by God to write two VBS programs and dozens of Sunday school lessons. My passion, my calling, is to write Christian curriculum. But today I need to share something different. I have to be honest, I have put off writing this post for some time. It is quite far out of my comfort zone, but I know that God wants me to share this with you. Our first son came into our lives just over a year and a half ago, and forever turned our lives upside down for the better. I have always worked with children in some capacity, but having my own son made me go back to the Word and reevaluate what I believe about raising kids. A lot of what I learned applies not only to parents, but to anyone who wishes to help “direct children onto the right path,” as Proverbs 22:6 says. 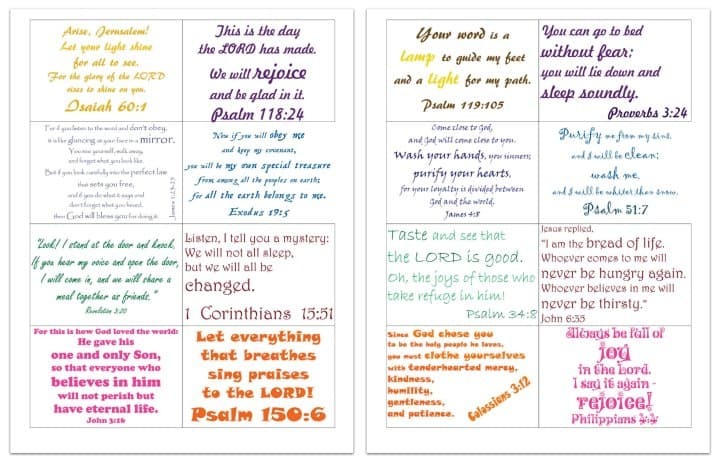 This whole endeavor started out with the included Bible verse cards. I wanted something to post around the house in order to keep Scripture ever before my eyes and the eyes of my son. But we’ll get to those later in this post. Let’s start out by trying to answer a rather simple question: WHY do we teach? Why do we parent? Please, take some time to consider this for yourself. Dive into the Bible and come up with your own reasons, along with considering my own discoveries. The goal of bringing up children is to raise up Spirit-filled followers of Christ. We want the children in our care to know the Word, to trust in Jesus, and to be led by the Holy Spirit to do great works for the Kingdom of God. So we read books, attend trainings, and pour hours of our time into preparing engaging, inspiring lessons for our kids. These are important things to do. We want to be relevant, to have the best teaching techniques and behavior management methods. We can talk methods and techniques all we want, but mentoring children comes down to our hearts. It’s one thing to know the lesson plan. It’s quite another to apply it to your life and let your life be the example for your students. I have seen this passage taught on during parenting sermons. We’re supposed to teach our kids about God through the Bible. This is true, and taking this passage apart reveals something much deeper than hanging Scripture in your home. Let’s start with verses four and five. They tell us that there is one God, and we must love him with every ounce of who we are. There is no room in our lives for second loves, second gods. I often fall into the trap of loving others instead of God. I love my husband and I love my son. But sometimes I let my love for my family blot out my love for my Savior. I put serving my family first. I put them on the throne in my heart instead of God and let them dictate the direction of my life. Instead of spending my first efforts of the day on prayer and Bible study, it is all too easy to starting caring for the needs of my family. I figure there will be time for God later. Let’s get this right. When we truly love God and put him first, his love fills us to overflowing. Out of his love, we are able to love others the right way. We can give our best love and our best service to our families and our students when we love God. We show God our love the way we would show anyone love. We spend time with him. We give gifts to him. We pray and read the Bible and attend church and tithe our time, money and abilities. Directing children onto the right path starts with directing ourselves there first. They will follow our lead. I love the way the New Living Translation phrases verse six. “And you must commit yourselves wholeheartedly to these commands that I am giving you today.” Commit yourselves wholeheartedly to these commands. I have to admit, I used to sort of skim over this verse, thinking the real meat of the matter was verses seven through nine. But this verse is the key to everything we do as Christians. Our understanding of who God is and how we relate to him comes from our understanding of the commands, of the Word of God. As Christians, we take the Bible to be the inerrant, everlasting Truth. Our beliefs, our thoughts, words and actions come from this book. So it stands to reason that we would wholeheartedly commit ourselves to understanding every bit of the Bible. That is no small task, but it is absolutely essential for everyone, especially to those who are called to be teachers. James 3:1 says, “Dear brothers and sisters, not many of you should become teachers in the church, for we who teach will be judged more strictly.” Teachers, know the Word. Treasure it up and soak yourself in it. Commit yourself wholeheartedly to knowing the commands of God, so you may not mislead your students. It is only after commanding us to fully commit ourselves to the Word that Deuteronomy instructs us to “repeat them again and again to your children. Talk about them when you are at home and when you are on the road, when you are going to bed and when you are getting up.” (Deuteronomy 6:7). The word should always be on our minds and in our mouths. Luke 6:45 reminds us that “what you say flows from what is in your heart.” So fill your heart with the word of God. I have found that when my focus is on the Lord and when I have been deep in the study of his Word, teaching his commands to my son and to my students comes naturally. Even when I have the perfect lesson plan, being in the Word myself changes how I present lesson plans. I am better prepared to naturally share the stories from the lesson and add other relevant Scripture because I spend my personal time studying for myself, and not only for my students. I love a good lesson plan. But written lesson plans are not enough. I want my life to be the lesson that others follow. Jesus is the perfect example of complete commitment. He is the perfect teacher and his life is the lesson plan we can and should all follow. God came down as a man, Jesus, and lived the perfect, sinless life loving and serving God and loving and serving others. He died the death that we should have died on account of our sins. He rose from the dead so he can live eternally with us. Let this truth be the one that drives you to be fully committed and to serve your children through loving God. Verses eight and nine are where the inspiration for the included household verses came from. They say, “tie them to your hands and wear them on your forehead as reminders. “Write them on the doorposts of your house and on your gates.” I don’t think we are literally meant to wear phylacteries or scribble John 3:16 on our arms in permanent marker. We are supposed to keep Scripture ever before us. I can have the best quiet time first thing in the morning and be inspired to make a difference, but by the time I actually get to my students, some of that fire has died down. In the hustle and bustle of the day, it’s easy to push the commands to the back of your mind. Having Scripture visibly posted throughout your house will help you remember the Word. It will help keep you wholeheartedly committed to the commands. That’s where these Household Bible Verse cards come in. These are ones I chose for personal use around my house and classroom. Feel free to use these and to create your own. Following is a brief explanation of each verse and why I chose it. May God use these to help draw you in to Him so you can be wholeheartedly committed to Him, so your life can be the lesson plan. Psalm 118:24 “This is the day the Lord has made. We will rejoice and be glad in it.” This is a good verse to put by a child’s bed or the front door of your classroom, so you can read it at the start of each day. God created evertyhing and designed each day Our every day has been written out by him. We rejoice in knowing that he has graciously given us each day. This means we can face the day without fear. Isaiah 60:1 “Arise, Jerusalem! Let your light shine for all to see. For the glory of the Lord rises to shine on you.” Put this one near a light switch and read when you turn the light on or off. Because the Lord shines his light on us buy giving us mercy and grace, we can let our light shine. We shine our light by telling others about God and by living life the way God wants us to. Exodus 19:5 “Now if you will obey me and keep my covenant, you will be my own special treasure from among all the peoples on earth; for all the earth belongs to me.” Here’s a good one to keep near the toy box, because toys are treasures to children. As much as a kid loves a favorite teddy bear, God’s love for us is even greater. He treasures us and will take care of us like his most valued possession. James 1:23-25 “For if you listen to the word and don’t obey, it is like glancing at your face in a mirror. You see yourself, walk away, and forget what you look like. But if you look carefully into the perfect law that sets you free, and if you do what it says and don’t forget what you heard, then God will bless you for doing it.” Of course, place this one on a mirror. Just glancing over the Word of God isn’t enough. We need to take the time to really study and learn to obey it. God blesses us when we follow his commands. 1 Corinthians15:51 “Listen, I tell you a mystery: We will not all sleep, but we will all be changed.” This is a funny one to put over the diaper changing table. When Paul says we will all be changed, he means we’ll all be made into the likeness of Christ, with new heavenly bodies after the end of time. Not everyone will sleep (meaning, not everyone will die an earthly death,) but all Christians will made to be like God wants us to be. Revelation 3:20 “Look! I stand at the door and knock. If you hear my voice and open the door, I will come in, and we will share a meal together as friends.” Jesus desires communion with us. Salvation isn’t some game of hide and seek, where we have to hunt down God. He comes to us. Being saved from our sins really is as simple as opening the door to our heart and letting Jesus in to be our friend. John 3:16 ““For this is how God loved the world: He gave his one and only Son, so that everyone who believes in him will not perish but have eternal life.” A must-know verse for everyone, John 3:16 reminds us of God’s unending, huge love for us. He gave up his son so we could love forever with him in heaven. Nothing compares to the sacrifice of God through the cross, and nothing compares with his love. Psalm 150:6 “Let everything that breathes sing praises to the Lord!” The previous verses of this Psalm speak of praising God with a variety of instruments. This is a good one to post by the music center or speakers, or to quote before worship as a reminder that we should praise the Lord in everything we do, in every way we can. Proverbs 3:24 “You can go to bed without fear; you will lie down and sleep soundly.” While this verse alone is a good reminder to kids that God is always looking out for them, in context this verse tells us that we have nothing to fear when we consistently work to be wise and discerning. Which means, when we live our lives like the way God wants. Psalm 119:105 “Your word is a lamp to guide my feet and a light for my path.” Put this one near a light or light switch to remind kids that just as the light helps us see where we are going, the Bible, specifically the law, or the commandments, help guide our lives so we can follow God’s will. James 4:8 “Come close to God, and God will come close to you. Wash your hands, you sinners; purify your hearts, for your loyalty is divided between God and the world.” We need to remember that we are sinners, far away from God. To wash our hands from our sin, we need to turn away from (repent) the evil things in the world and turn to God. Psalm 51:7 “Purify me from my sins, and I will be clean; wash me, and I will be whiter than snow.” This Psalm reminds us that we are all sinners and that without God’s help, we cannot live righteous lives. We need God to forgive us of our sins. When he forgives us, we are washed perfectly clean! John 6:35 “Jesus replied, “I am the bread of life. Whoever comes to me will never be hungry again. Whoever believes in me will never be thirsty.” Here’s a good one for wherever you serve food. Jesus proclaims this truth to the crowd of 5,000 people he fed, the day after that miracle. The crowd sought more bread, but Jesus reminded them (and us) that what we really need to be concerned about is not our physical lives, but our spiritual. Jesus is all we need to be satisfied in this life and the next. Psalm 34:8 “Taste and see that the Lord is good. Oh, the joys of those who take refuge in him!” A verse for the kitchen. When we’re trying a new food, we often just nibble at it. We then usually find that new food is delicious! This verse tells us to try God like we would a new food. We’ll find that his love is the tastiest, most fulfilling thing in the world! We can be happy because he will take care of us. Philippians 4:9 “Always be full of joy in the Lord. I say it again—rejoice!” Even when we go through tough times, we can have joy in Jesus. This does not mean we will always be happy. It means that no matter what happens, we have hope in Jesus Christ. We know that he died so we can live forever with him, and nothing bad can ever take that away from us! Colossians 3:12 “Since God chose you to be the holy people he loves, you must clothe yourselves with tenderhearted mercy, kindness, humility, gentleness, and patience.” Paul reminds us in the verses leading up to this one that we used to lie, cheat and be greedy and mean. These sins, all sins, belong in our past, before we asked Jesus to forgive us of our sins and before we began to try our best to be like him. Paul tells us to take off our old way of doing things, like we take off muddy, smelly clothes, and instead we need to put on a new way of doing things: Christ’s way. Very inspiring. God bless you. Tony Kummer (Editor) reviewed & updated this page on : September 27, 2016 at 2:01 pm. All our content is peer reviewed by our readers, simply leave a comment on any post suggest an update.